Wooing global investors, Prime Minister Narendra Modi today promised to make India the "easiest" destination to do business with a stable tax regime and a predictable, transparent and fair policy environment. Stating that the atmosphere of "despair and uncertainty" has gone away within a very short span of seven months, he said, "Since day one, my government is actively working to revive the economy. My government is committed to creating a policy environment that is predictable, transparent and fair." Modi, who assumed office as Prime Minister in May last year after BJP stormed to power with a huge mandate, said the government is working to provide a policy-driven governance. "Ease of doing business in India is a prime concern for you and for us. I assure you that we are working very seriously on these issues. We want to make them not only easier than earlier; not only easier than the rest; but we want to make them the easiest," he said. "We are trying to complete the circle of economic reforms speedily. We are also keen to see that our policies are predictable. We are clear that our tax regime should be stable. In the last few months, we have taken several decisions in this direction," he said. "... We are not only making commitments and announcements. We are also backing them up with concrete action," he said. 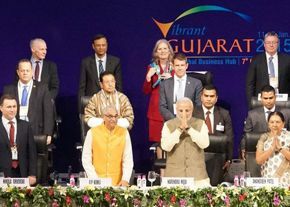 Speaking at the Vibrant Gujarat Summit here, with leaders from across the world, including top industrialist and US Secretary of State John Kerry, UN Secretary General Ban Ki-moon and World Bank head Jim Yong Kim, in attendance, Modi said that India is on the "path of transformation". Assuring investors that the government will "hold your hands whenever needed," he said: "If you walk one step, we will walk two steps for you. The first two quarters of the current financial year beginning April 2014 have seen growth rate which is one per cent higher than the previous year, Modi said, adding that IMF has predicted that India would be the second fastest growing economy in the coming years. According to the Organisation for Economic Co-operation and Development (OECD), India would be the only country among world's top economies which would increase its pace of growth this year, he said. Listing out recent initiatives, he said FDI in construction has been liberalised, 100 per cent foreign investment has been allowed in railways, the defence sector has been opened for FDI up to 49 per cent and a similar level in the insurance sector. Government, he said, is "working towards single window clearance at the Federal and State levels". The Prime Minister said the approach to problems has to change. Recession is talked of in isolation in the context of business and industry, but it results in low-level of per capital income in countries where majority of global population lives. "I assure this global platform that India wants to work with the global leadership. Be it issues of poverty or ecology," he said. Spelling out his vision, he said institutions and systems of delivery have to be strengthened. "You may be aware that our economic growth had slowed down during the last few years. Now, my government is putting all efforts to ensure faster and yet inclusive growth. The initial results are very encouraging." The focus is on building infrastructure like roads, gas grids, electricity and water systems, farm irrigation and cleaning of rivers through public and private investments. "In order to execute the infrastructure plan, a fast track PPP mechanism is being put in place." Sagarmala project is of modernising ports and developing new world class ports besides providing better road and rail connectivity for port-led development. Also, digital highways, i-Ways, besides highways, are being created. "To upgrade manufacturing infrastructure, we are setting up world-class investment and industrial regions along with the dedicated freight corridors and industrial corridors," he said.